How many teams and drivers? What is FANBOOST? 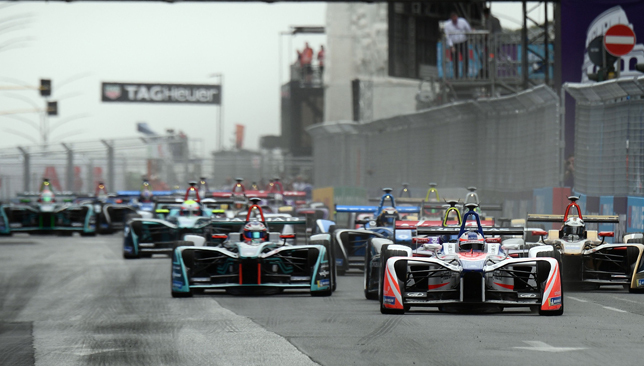 What kinds of circuits does Formula E use? Here’s everything you need to know about the basics of Formula E’s all-electric street racing ahead of new weekend’s season opener in Saudi Arabia. 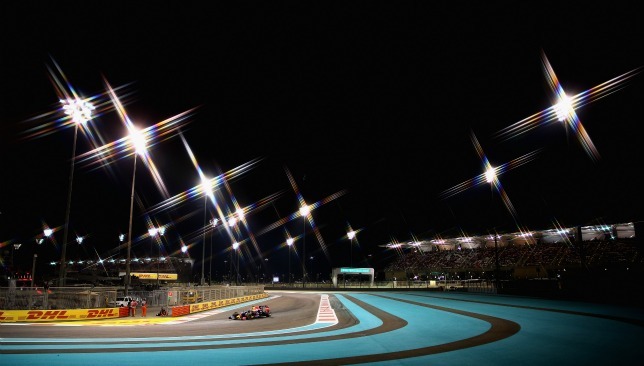 An exciting initiative to help young motorsport fans get the most from their F1® experience has been made available ahead of this weekend’s F1 in Abu Dhabi. The Junior Motorsport Book features fun facts and figures, team inspirational profiles and features on drivers including Lewis Hamilton, a comprehensive review of previous races at Yas Marina Circuit, and much more. Al Tareq Al Ameri, CEO of Yas Marina Circuit, said: “One of Yas Marina Circuit’s key objectives is to provide young people with a platform to enter motorsport. This starts with helping children make a strong connection with the sport from a young age. Key features of the Junior Motorsport Book include full team and driver profiles, a facts and figures section. Crucially, the Junior Motorsport Book provides children with the a guide on things to do at Yas Marina Circuit, inspirational stories of drivers including Lewis Hamilton, and young and upcoming local racers like Amna Al Qubaisi and Rashid Al Dhaheri and advice on how to embark on your own motorsport careers. From karting to regional youth championships to the international stage of GP3 and F2, the book plots a course for the younger generation to follow in their heroes’ footsteps. Romain Dumas and co-driver Matt Jones take on the dunes of the Chopard Classic Rally Dubai. We couldn’t win despite having a professional driver with three 24 Hours of Le Mans titles behind the wheel. We were the only team to run out of fuel as well, so it’s safe to say I don’t think I have a career in co-driving ahead of me. 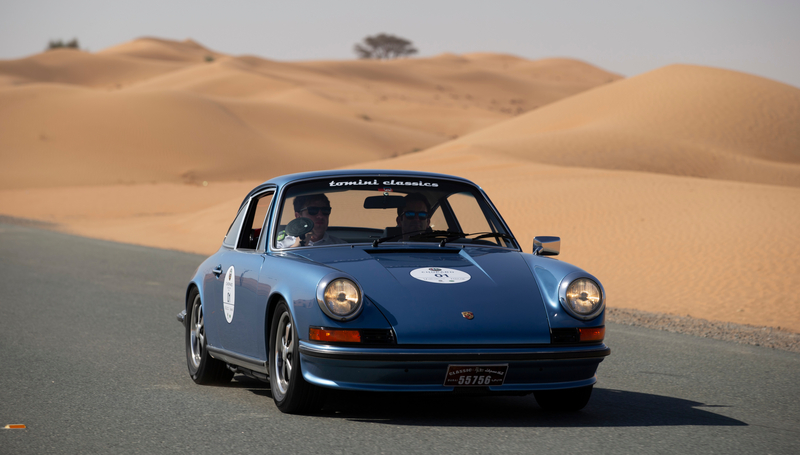 Then again, 19th place out of 30 entries – finishing just 46 minutes, 47 seconds adrift of the winning team – doesn’t seem so bad, considering Romain Dumas had an absolute novice on the notes beside him at the second annual Chopard Classic Rally Dubai. Negotiating the 10-minute route from my flat in Dubai Marina to the Sport360 offices in JLT on a daily basis is about the extent of my navigational nouse – Google Maps is the greatest invention ever. So, I was more than a little perturbed when tasked with getting Romain and I safely home via a 500km+ route from downtown Dubai, out to Hatta and back. It was actually going rather smoothly, until the rather unfortunate fuel incident between the penultimate time control point in the race’s twilight stages. We often take for granted the beautiful surroundings on offer to us here in the UAE. Dubai and Abu Dhabi receive a lot of focus from the outside world for their stunning architecture and impressive sporting portfolios. 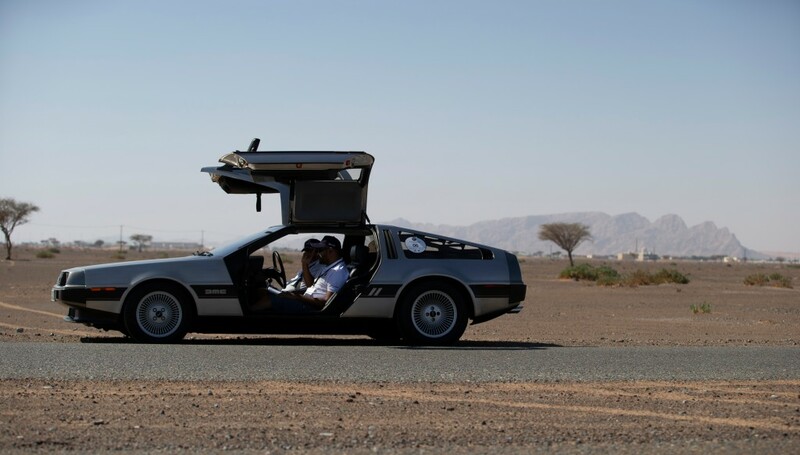 Imthishan Giado and Mohammed Giado in their 1981 Delorean, made famous by the Back to the Future films. But amidst all the sand and splendor in this oil-rich nation, there are some stunning hidden gems to discover. The drive to Hatta certainly comes under that category. Stunning scenery is almost a constant on the 500km trek from the race’s processional start at the Armani Hotel Dubai – taking in Sharjah, Ajman and Umm Al Quwain. Though I can’t say I’d like to have been stranded by the roadside in Al Lisaili for much longer. The rally starts from the shadows of the Burj Khalifa, but it is only when we leave Dubai’s stunning skyline behind that the real beauty of the Arabian Gulf truly comes into focus. Once off the main highways I safely negotiated Romain and our sleek and stylish, vintage 1973 Porsche 911 2.4S, deep into the heart of the epic Hajar mountain range, which offers UAE residents some of the finest driving routes imaginable. You can get lost here, spending your day exploring serene and silent canyon roads. Most are completely empty and perfectly surfaced, with some virtually ancient villages and settlements hidden not too far away. Unfortunately, we didn’t have time to get lost – we had a pace to maintain and a rally to win. We snaked our way from Dubai, along the E102 to the halfway point of the rally, the quaint Hatta Fort Hotel, the route interspersed with exciting and challenging regularity tests. 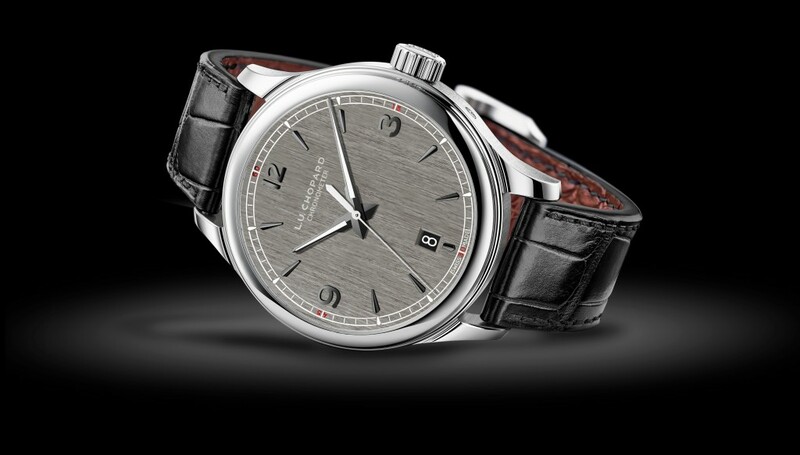 The limited edition L.U.C 1937 Classic Rally Dubai Special Edition watch. In the surrounding mountains, a bright white ‘Hatta’ sign has been constructed in bold, squared letters, identical to the iconic Hollywood sign in the hills above Los Angeles. And at the halfway point of the race, Romain and I seemed set for a fairytale ending. But as we headed off on the second leg, back towards Dubai, there was to be a late plot twist. We decided against filling up with half a tank of fuel remaining, choosing instead to eat up some miles. What did I care? Romain, 40, claimed the FIA World Endurance Championship title in 2016 alongside Porsche team-mates Marc Lieb and Neel Jani, so is used to pushing things to the limit. But upon entering Al Lisaili, it became clear that as we’d been pushing the classic Porsche to its limits, we’d also been pushing our luck. We were aiming to drive off into the sunset as champions, yet here we were, now stranded by the side of the road. The only person disappearing into the sunset was a helpful race marshal to get us a carton of petrol. A good half an hour was lost, although Ales-native Romain and I laid it all on the line down the home stretch. And we were only slightly late arriving at the finish line back at the Armani – a little over 10 minutes behind our scheduled finish time, with our total time of 7 hours 20 minutes 30 seconds good enough for 19th place. The winning team of Britain’s James Iremonger and Lebanese co-pilot Gilbert Ayoub steered their 1954 Jaguar home in 6:34:47 – earning themselves a limited edition L.U.C 1937 Classic Rally Dubai Special Edition watch. 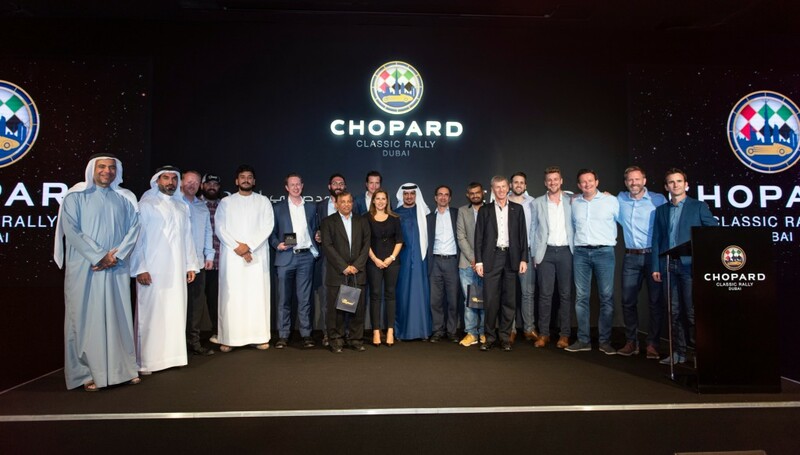 Chopard Classic Rally Dubai award winners. Produced in a 20-piece limited series and dedicated to Middle Eastern classic racing enthusiasts, Chopard created this handsome chronometer; a timekeeper with extraordinary finishing which is an essential instrument for the gentleman who seeks excitement and luxury. Organised by Chopard, along with partner Ahmed Seddiqi & Sons and Emaar Properties, the Chopard Classic Rally Dubai brought together 30 classic sports cars on Friday, November 9, coming from the UAE and Gulf region, as well as further afield, including across Europe and the United States. The awards ceremony and dinner took place at the Armani that evening where other winners included: Best in show car, Shehab Gargash and Ahmad Al Matrooshi (1970 Mercedes Benz 280 SE Cabriolet); Spirit of the Rally, Laurence Bridger and Julia Maria Kangas (1969 Cadillac de Ville 6 Window); Emaar Award 1st Novice, Ali Al Fardan and Ahmad Al Nashash (1977 BMW 2002); 2nd overall, Peter Somekh and Anthony McCarter (1968 Jaguar E Type 1.5) and 3rd overall, Imthishan Giado and Mohammed Giado (1981 Delorean DMC 12).